As a pet parent, your dog relies on you for everything. He looks to you for comfort and affection, and he counts on you to ensure that his health needs are being met. Since you want your four-legged family member to life a long, happy, and healthy life, you go out of your way to make sure that you are providing him with the best products that will meet all of his needs. He enjoys snoozes in the most comfortable dog bed, a top-of-the-line dog house offers him protection when he’s outside, and you even put him in a dog raincoat so he stays nice and dry during those rainy day walks. As a pet parent, you are proud to offer your pooch the best of everything. There’s another product that you don’t want to slouch on when it comes to your furry friend’s care: his dog food. Just like humans, canines require a well-balanced diet that meets their nutritional needs in order to ensure that they are healthy and happy. If your canine companion is highly active, or if he’s prone to joint issues (like Pugs, Boxers, and French Bulldogs are), then he might need a high protein diet. Protein is the building block of muscles, so feeding your pooch a food that contains optimal levels of high quality protein will ensure that his joints and muscles are strong and healthy. Protein will also provide your pup with the energy that he needs to sustain an active lifestyle; plus, it helps to improve the health of his skin and coat. If you’re on the market for high protein dog food and you don’t know what to choose, we’ve compiled a list of the top five high protein dog food options that are currently on the market. Why is Protein Important for Dogs? Why do Some Dogs Need More Protein? By selecting one of these brands, you can ensure that your furry friend will not only be getting the protein that he needs, but that he will also receive the most balanced nutrition, including the essential vitamins and minerals that he needs in order to thrive. Which formula will best suit the needs of your dog? Below, we offer a detailed overview of each of these high protein dog food options, including the ingredients featured in each one, what we like about them, and what pet parents have had to say. Once you have finished reading through the reviews and have decided on a formula that you think will work the best for your furry pal, click on the buttons to find the best prices currently listed on Chewy and Amazon. 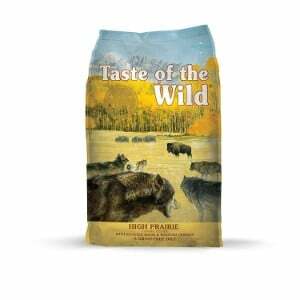 We start our list of the best dog food brands with Taste of the Wild Grain Free High Protein Dry Dog Food. Countless pet parents feed their four-legged family members Taste of the Wild dog food because they know that they can count on this brand to offer highly nutritious, well-balanced food that also offers a palatable flavor. That’s because Taste of the Wild uses only the highest quality ingredients and never uses byproducts or fillers, like many other dog food brands that are on the market. This formula from Taste of the Wild is a high protein dog food, so if your vet has told you that your pooch needs more protein in his diet, then this is a great option to choose. Protein is the building block of muscles, so this dry dog food will help to support healthy joints. Many dog breeds are prone to joint issues, such as German Shepherds, Saint Bernards, Rottweilers, Golden Retrievers, Newfoundlands, and Chesapeake Bay Retrievers. By offering your pet a high protein diet, you can help to stave off conditions like hip and elbow dysplasia, which can be extremely painful and cause mobility problems. The ingredients featured in this Taste of the Wild formula are top-of-the-line. Just like all of their other formulas, real meat is the first ingredient. In this recipe, Buffalo is the primary source of protein, followed by lamb meal and chicken meal, which combine to offer up a healthy dose of protein that will keep your pet’s muscles and joints healthy and strong. Other ingredients include easy to digest carbohydrates, like sweet potatoes, peas, and potatoes. Blueberries, raspberries, tomato, and a bevy of supplements (like vitamin B12, taurine, zinc sulfate, copper sulfate, vitamin D, and biotin) round out the list of ingredients. Everything used in this formula is sourced from trusted and sustainable sources, and there are absolutely no grains, byproducts, or artificial flavors or preservatives used in this recipe. The bottom line: when you offer your pet Taste of the Wild Grain Free High Protein Dry Dog Food, you can ensure that he is getting the best nutrition possible. Bottom Line: If your pet needs more protein in his diet, Taste of the Wild Grain Free High Protein Dry Dog Food is an outstanding choice. Made with premium quality ingredients, you will have confidence knowing that your furry friend is getting the best nutrition possible. 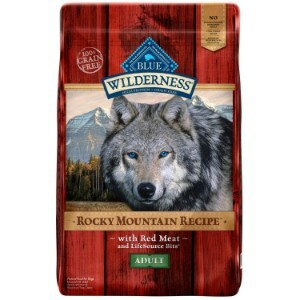 Next up on our list of the best dog food brands Blue Buffalo Wilderness Rocky Mountain Recipe High Protein Grain Free Dry Dog Food. Blue Buffalo dog food is one of the most trusted brands, and for good reason: the manufacturer hand selects the ingredients that are used in each formula to ensure optimal nutrition. If your pet requires a high protein, grain free dog food, then this is an excellent formula to consider. The first ingredient featured in this formula is deboned beef, which is an excellent source of protein. It also features chicken meal, a natural source of glucosamine, a nutrient that is important for healthy muscles and joints. Instead of using corn, wheat, and soy as carbohydrates (which many dog food brands use), Blue Buffalo uses peas, barley grass, sweet potatoes, and other natural and easy to digest carbs, so if your pet needs a dog food for sensitive stomachs, this recipe is a great option. A bevy of fruits and vegetables, like cranberries, blueberries, dried kelp, and potatoes are also featured. It’s also infused with essential vitamins and minerals, such as vitamin A, copper, taurine, calcium, folic acid, and B vitamins. Lastly, like all other dry dog food from Blue Buffalo, this recipe features Life Source Bits, which contain a precise blend of antioxidants, vitamins, and minerals. Final Verdict: Blue Buffalo Wilderness Rocky Mountain Recipe High Protein Grain Free Dry Dog Food is a delicious and nutritious food that you and your pet will be sure to love. Made with premium quality ingredients and free of byproducts, artificial agents, and harmful chemicals, you can be sure your pooch will be getting the best possible nutrition. Pet owners have been trusting Purina dog food to meet the nutritional needs of their furry friends for decades. The manufacturer makes a number of different formulas for dogs of all ages, sizes, and lifestyles, including senior dog food, food for small dogs, and food for large dogs. 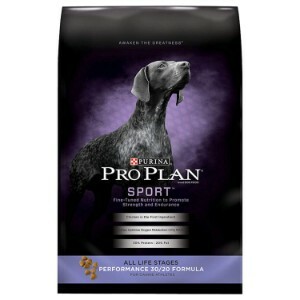 This formula is specifically made for canines that live an active lifestyle. What sets this high protein dog food apart from other formulas featured on our list is the fact that it contains a specific balance of protein and fat: 30 percent of the recipe is protein and 20 percent is fat, which helps to ensure that your dog’s metabolic needs are being met while also maintaining his lean muscle mass. The first ingredient featured in this recipe is real chicken. It also contains fish meal, which is a great source of lean protein and natural glucosamine. Other ingredients include digest brewer’s rice and fish oil, and it has been infused with vital nutrients, such as vitamin A, vitamin B, vitamin D, calcium, folic acid, vitamin B12, and biotin. According to the majority of reviews that we read, pet parents are very happy with this recipe; however, it should be noted that it does contain corn, so if your dog is sensitive to grains, this might not be the best high protein dog food for him. Final Verdict: To ensure your active dog is getting the energy that he needs, Purina Pro Plan will provide him with the right balance of protein and fat that will fuel his energy levels. 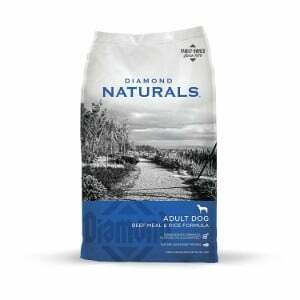 Next up on our list is a formula that comes from Diamond Naturals dog food. This manufacturer is also highly regarded, as they on use the very best quality ingredients in their recipes and they offer a variety of formulas to meet the nutritional needs of dogs of all ages, sizes, and lifestyles. If you have an adult dog that requires a high protein diet, then you should seriously consider filling your pet’s dog bowl with Diamond Naturals Dry Dog Food for Adult Dog. This recipe is made with the highest quality protein, which has been sourced from pasture raised beef. It contains an optimal amino acid profile to support lean muscle mass and healthy, strong joints. It will also fuel your furry friend’s energy levels so he can enjoy long walks on his dog harness and playing with his automatic fetch machines. This recipe also contains a bevy of superfoods, like blueberries, pumpkins, quinoa, dried kelp, coconut, spinach, and even papaya to support proper nutrition and a healthy lifestyle. The infusion of vital nutrients, such as zinc, copper, iron, beta carotene, vitamin B6, vitamin D, folic acid, and potassium all combine to create a premium quality high protein dog food that you can have confidence knowing will meet the nutritional needs of your canine companion. Final Verdict: Diamond Naturals Dry Food for Adult Dog is a great choice to consider if your four-legged family member required a high protein diet. Made with only the highest quality ingredients to ensure optimal nutrition, you can be sure that your pet will be eating a delicious and nutritious meal when you offer him this food. The last recipe featured on our list of the best high protein dog food options is another formula that comes from Purina. Their Smart Blend True Instinct Natural with Real Turkey and Venison Adult Dry Dog Food is made specifically for high performance dogs, such as working class and sporting group breeds; or, any other dog that has high energy. It’s a natural food that is made with premium quality ingredients and is infused with essential vitamins and minerals to ensure your pooch is receiving the very best nutrition. This formula is made with a blend of real turkey and venison, both of which are great sources of protein and deliver a taste that will certainly appeal to your pet’s palate. The infusion of essential vitamins and minerals will promote a stronger immune system, strengthen your dog’s bones and joints, support his digestive health, and even improve the health of his skin and coat. Since the ingredients are highly digestible, you can be sure that your dog will be absorbing maximum nutrition. 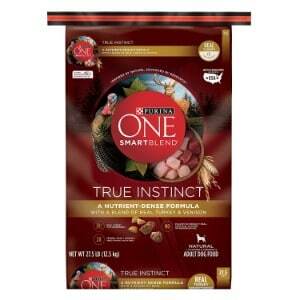 Final Verdict: For a high protein dog food that offers balanced nutrition to support optimal health, Purina One SmartBlend True Instinct Natural with Real Turkey and Venison Adult Dry Dog Food is a great option to consider. It features high quality ingredients and offers a 30 percent protein content. Your goal, as a pet parent, is to ensure that the furriest member of your family is receiving the best nutrition possible so that he can be as happy and healthy as possible. For some dogs, that means feeding them a high protein diet. Why is protein important for dogs? Why do some dogs need more protein than others? What type of factors should you consider when you are selecting a high protein food for your pooch? In this section of our review, you’ll find the answers to these questions so you can make the best choice for your canine companion. To ensure your pet is getting the nutrition that he needs, it’s important to feed him a well-balanced diet that features high quality proteins. Protein is a vital nutrient that all animals require, including canines. While man’s best friend also requires other nutrients, like carbohydrates, and fats, protein is the most important. That’s because canines are naturally carnivorous, which means that their bodies need this nutrient in order to thrive. In the wild, canines hunt for their food, and animals make up the largest portion of their diet. Protein contains amino acids, organic compounds that play an important function in several essential bodily functions. Canines require a total of 22 amino acids in their diet, and 10 of them have to come from their diet because their bodies do not synthesize them naturally. Therefore, it’s important to feed your pooch a food that contains a balanced blend of high-quality proteins that are preferably sourced from meat. While protein is important for all dogs, some need more than others. For example, puppies need more protein because they are growing at a rapid rate and protein helps to support their development. Active dogs, such as those that are used for herding and hunting, or those who compete in agility contests, require more protein because this nutrient fuels their energy levels. Pregnant and nursing canines also need more protein to nourish their bodies as they develop and feed puppies. There are a lot of high protein dog food options to choose from; however, not all of them are the same quality. When you’re shopping for a high protein formula, take the following factors into consideration. Protein percentage. A high protein dog food should contain approximately 30 percent protein to ensure needs are being met. Protein source. Read the labels. Make sure that protein is listed as the first ingredient, and ensure that the protein comes from a high-quality source, such as lamb, venison, turkey, chicken, beef, or fish. Additional ingredients. Check to make sure that the food also contains other essential vitamins and minerals to support your pup’s overall health; fatty acids, natural carbohydrates, and glucosamine, for example. Feeding your pet a high quality high protein dog food will help to ensure that he is getting the balanced nutrients that he needs to support his nutritional needs. Each of the high protein formulas featured in this review are made by highly regarded manufacturers and contain premium quality ingredients. If, however, you decide to opt for another formula, make sure that you take the factors listed above into consideration before you make a choice.